Flavours What would you choose for a wedding cake ?. A few weeks ago we made a 4 Tier Wedding cake for one of our customers and they chose to have different flavours for each tier. The bottom tier was Chocolate orange sponge with vanilla buttercream. we make our Chocolate orange sponge using fresh orange zest to give a nice light fresh orange flavour ( we don’t use orange flavourings). The second tier was Hazelnut sponge layered with Nutella and Nutella buttercream. Now for the Bubble Gum!, the flavour they requested for the top tier was something we had not made before. This was Bubble Gum flavoured sponge with bubble gum flavoured buttercream. The sponge was coloured pale pink & the buttercream a pale blue colour and both were flavoured with natural bubble gum flavouring. All the tiers were covered with a thin layer of marzipan (this we think gives a better finish to the cake) we then covered this with white sugar paste. The back of the cake was designed by the Groom. Who wanted a Super Heroes theme. 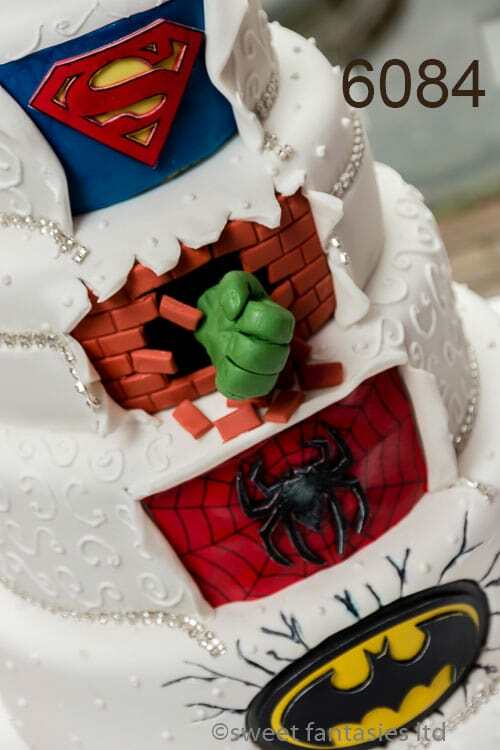 The handmade model of the Bride and Groom had the Groom wearing an open jacket revealing the Superman logo on his chest. 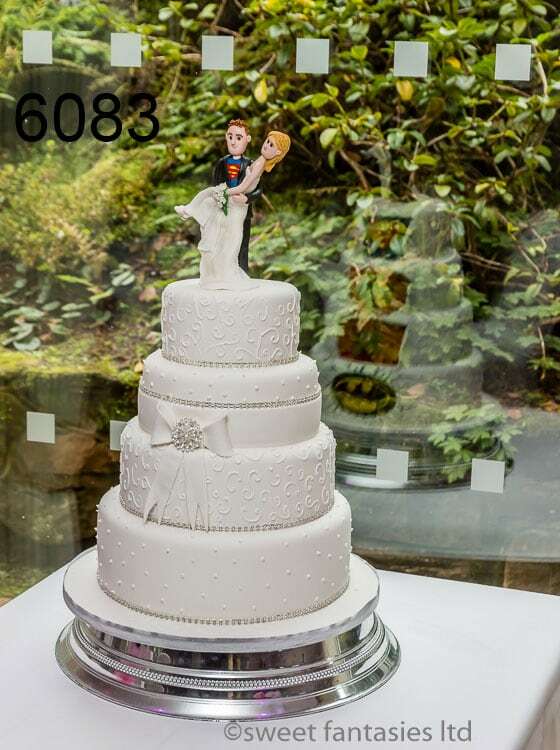 We delivered the cake to their venue, The Upper House Hotel, Barlaston. A lovely venue which is set in 10 acres of woodlands and beautifully landscaped gardens. Delivery and setting up of wedding Cakes in the Stoke-on-Trent area is included in the cost of the cake (additional charge may apply outside of Stoke-on-Trent). This was my cake . We would like to thank you very much you kept perfectly to my design and brought it to life fantastically .the flavours were all fantastic it was a perfect piece at the wedding it caught everybody’s intrest and now wished we made the bubblegum tier bigger as it was a big hit .im a peanut butter lover an that definatly hit the spot .thank you again so much.we will be using you for all our special occasions so expect more bubblegum orders. We’re Pleased you liked your cake,The Bubble Gum sponge as been quiet a talking point, Hope to see you soon for some more Bubble Gum sponge cakes, All the best to you both for future.